Its spring. Time to look down...at your asphalt. Although it may seem hard to believe by looking out the window, Spring will be here before we know it. Along with everything else on your “to do” list, now is a great time to think about your parking lot and other paved areas. In general, you’ll want to evaluate and make repairs to any cracks or damage you find. Being proactive in fixing small areas now can help extend the life of your paved areas and avoid a larger capital investment to fix larger areas down the road. Once the snow melts, do a thorough visual inspection of your parking lot and paved areas. Make note of any small cracks or damaged areas. These are areas you want to repair as soon as possible. Cracks allow water to seep into the asphalt weaken the structure from underneath. Potholes are not only unsightly but dangerous – they can put your business at risk of a lawsuit if they contribute to a fall, accident or injury. Asphalt problems are dangerous. 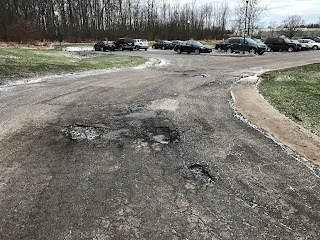 If you have potholes or significant cracks and other areas of deterioration in your parking lot, you are making yourself vulnerable to lawsuits in case of a fall, accident or injury. Having to pay up for personal injury damages or damages to a vehicle is way more expensive than having that pothole fixed. Check your records to see if you’ve had sealcoating performed within the last few years. If not, you should make this a priority and contact Holland Paving & Sealcoating to get it scheduled. Sealcoating guards the asphalt from the sun, ice, salt, oils, and other chemicals that shorten the life of your pavement. It also ensures a longer lasting life for your pavement, lowers repair costs and gives your pavement a fresh, new black appearance. If the lines and striping in your parking lot are fading, it’s time to freshen up or re-stripe your lot. A fresh coat of paint not only improves your curb appeal, it helps your company comply with applicable regulations and shows your customers that you care about their safety. You’ll want to make sure that your parking spaces, fire lanes, handicapped areas, no parking zones, speed bumps and loading zones are clearly marked. You’ll want to use rugged, long lasting paint materials, applied with professional techniques. 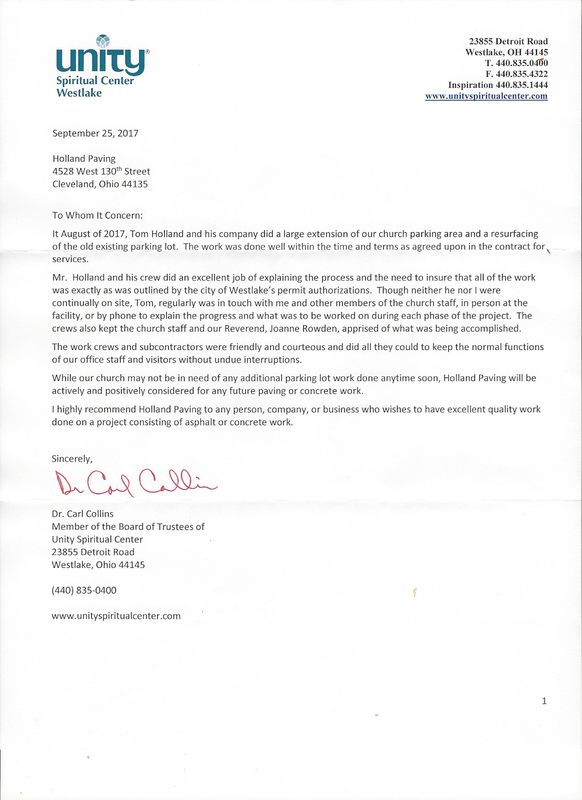 We can help you select and apply the right paint for all your parking lot striping needs. Sweeping your parking lot on a regular basis to clear rocks, leaves, and dirt will not only make it more attractive and safer for your customers, but also extend the life of your pavement. Make sure you check and clear basins/drains on a regular basis as part of your cleaning process. Regular cleaning helps prevent build-up of harmful debris that can clog drainage and create the perfect environment for cracks and pothole to form on your asphalt surfaces. Holland Paving & Sealcoating offers a full range of asphalt and concrete construction services that includes seal coating, hot crack filling, line striping, excavation services, asphalt patching and paving. No matter what your area is made of or how it’s being treated, we can recommend the most appropriate solution. Call us at (216) 671-9333 and we’ll work out the logistics with you. Ask us about our multiple property discount program and custom maintenance programs. We are YOUR asphalt specialists. Sorry Cleveland, Winter is here! The best time of year to think about parking lot and driveway maintenance is now. The best time for maintenance is in the spring! After all of the snow has melted and all of the damaging salt has washed off, it's time to look at your pavement. It's time to consider crack sealing and sealcoating. In cold temperatures, pavement contracts and cracks open to their widest. In hot temperatures, pavement expands and closes the cracks. 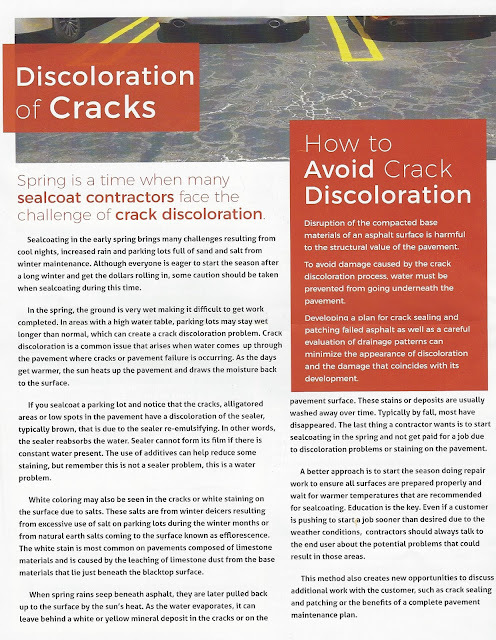 This is why the moderate temperatures in spring are optimal for crack repair. At Holland Paving, we specialize in asphalt maintenance and Cracksealing is one of our specialties. Crack sealing is different from crack filling for several reasons. Asphalt pavement is referred to as a flexible pavement that moves horizontally due to changes in temperature and may move vertically as a result of traffic loads. Some cracks can open up to 100% of original width as the pavement temperature changes from summer to winter extremes. So generally speaking, asphalt pavement is always moving to some degree. Crack sealing uses specialized material that will adhere to the pavement and retain the seal as the pavement moves. Crack filling uses normal material that does not have high or low temperature properties to remain flexible at low temperatures and stable at high temperatures, and when pavement movement takes place, the seal is broken. 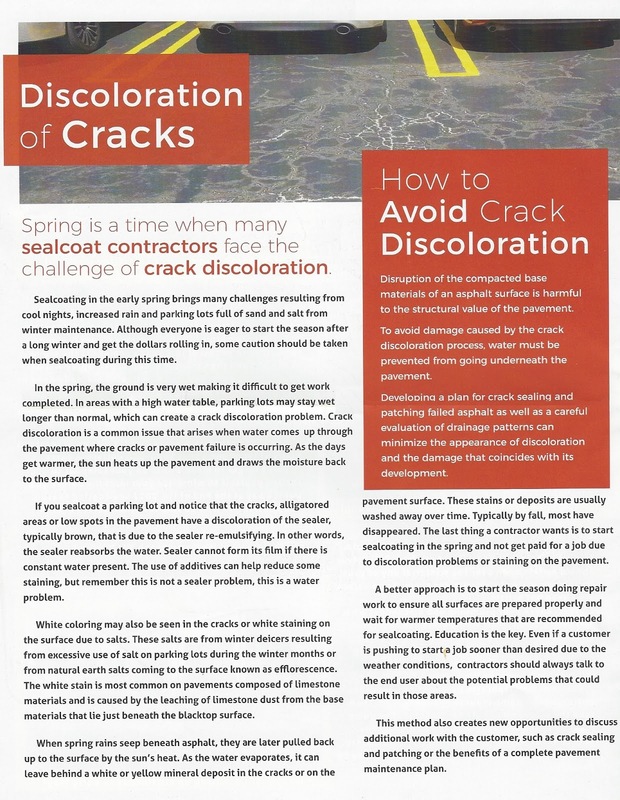 This is one example why crack sealing prevents intrusion of water and crack filling reduces intrusion of water – sealing and filling are not the same. Give us all call for a free estimate. As long as your asphalt is free of snow and ice, we can give you an accurate price for the upcoming spring season. Yet another happy and satisfied customer. WHAT QUESTIONS SHOULD YOU ASK YOUR PAVING CONTRACTOR? Choosing a paving contractor is difficult. Making sure you choose the right contractor for your specific project is also vitally important. Most people looking to hire a paving contractor know little about the paving process, which is entirely understandable. However, this can make it difficult to know what to ask of a company when you’re gathering bids for your project. By asking the following questions, you’ll be able to ensure you’re getting higher quality bids and ultimately educating yourself enough to choose the right paving contractor for your project. There are no "dumb" questions. Remember, you're the boss. how long have you been a paving contractor? If a company has been around for a while, you can be more assured they’ll be around for years to come. It’s nice to develop a relationship over time with a paving contractor you trust. Doing so makes tackling future paving projects far less daunting. But remember, just because they’ve been paving for years doesn’t mean they necessarily do good work. So it’s important to dive a little deeper. what are the most important elements of my project? Getting the right scope of work is an essential first step in the paving process. Identifying the most important aspects of a project should be priority number one. Once you’ve figured out what is essential, you can discuss those elements that could be beneficial to the project but aren’t essential. You can then make sure you’re getting everything you want, given your budget. WHAT exactly is included in the scope of work? Some scope of work documents can be confusing. If you’re gathering bids from multiple paving contractors, confusing scope of work documents can make it very difficult to compare the bids to one another. Make sure your potential paving contractor has clearly detailed exactly what’s included in your project. An accurate, detailed scope of work that matches your needs lays the foundation for a successful paving project and will make your decision much easier. will my project present any unique challenges? Some projects have unique challenges that can make them more complicated. Push your paving contractor to be thoughtful initially, accounting for any unique challenges that may arise. A bit of forethought can go a long way when it comes to completing high-quality work on time and within budget. are there any additional or "hidden" fees? This is a good question to ask any contractor, and paving contractors are no different. Make sure you aren’t going to be hit with hidden costs for “additions” halfway through a project. what are some projects you've paved in this area? Ask for a list of projects in the area the contractor has paved. Drive over to see how the project came out. Go view their work firsthand. are you accredited with the better business bureau? First, you’ll want to hire a paving contractor that’s an accredited member of the Better Business Bureau. It adds a level of accountability and helps ensure they’re an upstanding company. You may be able to tell a lot about a contractor based on how forthright they are in answering this question. Second, you can see a history of any complaints filed in the past by visiting the Better Business Bureau’s website. A company that has a history of complaints should raise some red flags. is asphalt or concrete best for my project? You shouldn’t be expected to know if asphalt vs. concrete is best for your situation. That’s the job of your paving contractor. Ask them to provide their rationale for using a certain material. They should be able to explain it in a way that makes sense. We know there’s a lot to consider when hiring a paving contractor. Hopefully, these questions will help you find the best contractor for your individual project. Of course, if you’d like to talk to us about your paving project, please let us know. We’d be happy to talk it over with you. The 2017 paving season is around the corner! As we move further into the new year and begin to look at our parking lots and driveways, we begin to see the damage that the last year has brought us. Let's face it, Cleveland weather is no friend to asphalt. While the continuous freeze/thaw cycles tend to be tedious for Clevelanders, these cycles can be particularly bad for our driving surfaces. Cracking, breaking, heaving, flexing, and sinking pavement is usually the result of a winter season that can't make up it's mind. The highly varying temperatures, coupled with precipitation are to blame. At Holland Paving & Sealcoating, we specialize in parking lot and driveway maintenance. Our Commercial Division is equipt to repair any degree of damage efficiently and professionally while being cost effective at the same time. If you're a residential customer, rest assured, our Residential Division hits the same standards as our Commercial crews. At Holland Paving & Sealcoating, our customer's needs come first. Give us a call today and get a head start on your estimate before the season starts! Copyright © 2016 Daniel Mazzeo Website Solutions.